Home prices in the country, spurred by low mortgage rates, continue to forge ahead. On average, American home prices have recovered nearly all their losses from the 2006 crash, but when adjusted for inflation they still have some ground to cover at 20% below the 2006 peak. Home Price Index (HPI) indicates that home prices nationwide, including distressed sales, gained 1.1 percent from June and were 6 percent higher than in July 2015. Oregon and Washington continue to top the charts with double digit annual increases of 11.2 and 10.2 percent respectively. Leading that charge were the cities of Portland – which saw 12.6 percent gains – and Seattle – which saw an 11 percent jump. They were followed by Colorado at 9.3 percent, West Virginia (8.6 percent) and Utah (7.9 percent.) 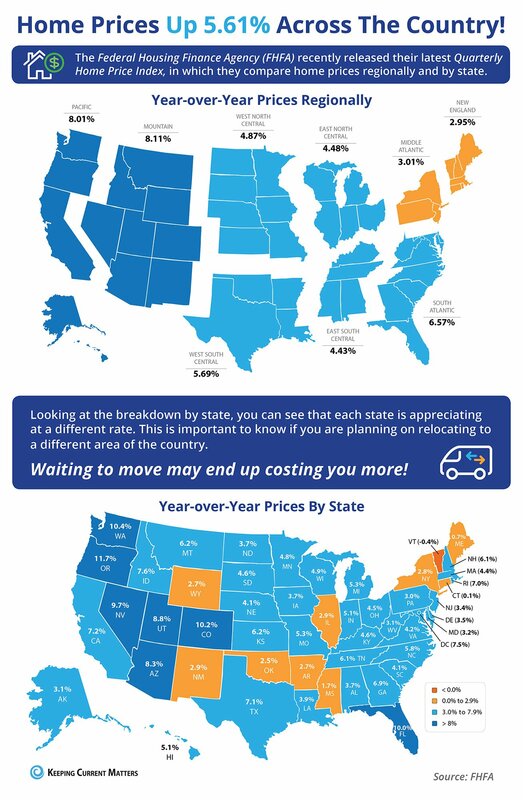 Only one state failed to net an annual gain – Connecticut – where prices dipped 1.2 percent. Price gains in the Midwest were mixed. Home prices in Cleveland and Chicago rose just 2.5 percent and 3.3 percent, respectively, while in Minneapolis they climbed a faster 5.1 percent. Southern cities saw stronger increases. Home prices jumped 8.9 percent in Dallas, 7.9 percent in Tampa, and 5.8 percent in Atlanta. Inventory continue to be a key driver in home value appreciation and, with housing start numbers lagging, is poised to dog us well into 2017 at least. Part of the inventory problem revolves around the lack of a skilled workforce needed to ramp up construction. Eight years after the housing bust drove an estimated 30 percent of construction workers into new fields, homebuilders across the country are struggling to find workers at all levels of experience, according to the National Association of Homebuilders. The association estimates that there are approximately 200,000 unfilled construction jobs in the U.S. – a jump of 81 percent in the last two years. What happens when you have a shortage? Prices rise. That’s simple supply and demand economics. Not only is the supply of homes constricted, but the cost of labor is more which bleeds over into inflated home values for new construction and for existing homes too. The good news is that single family housing starts in June were up 13 percent from the previous year with all housing starts – including multi unit – increasing as well. The positivity carried into July which posted the some of the strongest housing start numbers since the crash. In other words, hang in there the inventory just might be coming after all. Let’s just hope the record low mortgage rates are around to see it.